We think you will be interested in this topic if your living in a country where fleas, bugs or insect problem through the year. This article primarily details about the common plants that are grown in many houses can actually helpful in repelling fleas and insects. Although flea busting bombs are very effective in getting rid of fleas, we feel there is an option available to prevent the fleas entering your home and repel them away naturally without killing them. 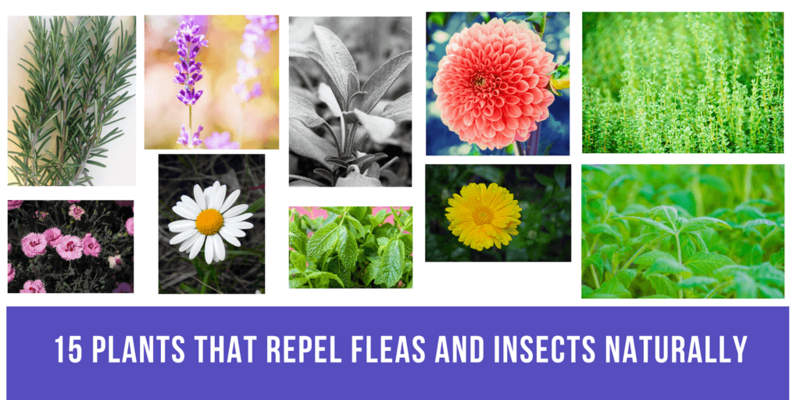 There are 15 plants which are effective on repelling not only fleas but also mosquitoes, flies, cockroaches and other household flies and other common garden pests. Plants are being used as perimeter check point to stop insects and biting bugs into home or living area in the early ages by farmers and plant lovers. Also, these plants are used as barriers to control the damage causing by the insects in farms and graneries. Today these plants are being sold commericially as botanical insecticides under organic category to control insects and bugs effectively at low cost without damaging the living environment. what kind of flea repelling plants can you grow at home? Any plant in the below list can used to grow. However you can choose a small herb or garden plan that can be grown in-front or back of your house or even outside the kitchen. Chrysanthemums are mostly consider to be a flowering plants apart from that it has ability to repel the insects. It acts as insecticide by the way pyrethrin is a component collects from the flowers of chrysanthemums. Pyrethrins in Chrysanthemum plants which attack the nervous system of insects like fleas and mosquito and insects lose their ability to bite and also it act as insect repellent plant. Lavender is a flower plant and also comes under the mint family. It is planted as ornamental plants in garden and used for its herbal value. Mostly it is grown for lavender oil it is one of the essential oils. It has the medicinal property such as antiseptic and anti-inflammatory. People grow this plant in their house and indoor for natural mosquito repellent also flea repellent. Garden mint is another name for spearmint. It is also considered to be an herbal plant and it will grow in plants it needs partial shade. It is used for various purpose the oil extract from spearmint produce aroma oil. It is an effective insecticide and fight against the insect repellent for both fleas and moths. The catnip otherwise called as catmint both catnip and catmint are the name comes because of cats mostly go towards and use it.cat nip is cultivated as ornamental plants and also it is grown as garden plants.Nepetalactone is the ingredient contain in catnip that fight against insects. So that catnip repels flies, fleas, mosquito repellent and also works to cockroach repellent. By mix little catnip with water and used as bug repellent by spray at the outdoors and it is nontoxic to humans and pet animals. It is also one of the natural roach deterrent. The extract of catnip as essential oil used for various bug repellents. Corymbia citriodora is a tall growing tree and it is otherwise called as lemon eucalyptus and various names it has. Lemon eucalyptus leaves contain a citronella which can be extract as essential oil such as citronella oil. The essential oil from lemon eucalyptus is used for perfumes which is unrefined whereas the refined essential oil is used for insect or Bug repellent. Especially refined essential oil that is citronella oil which effectively repels mosquito. Basil is a culinary herb which is used for both the purpose for eat as food and also for insect repellent. Basil is in different type and each type of basil as its unique herbal value and benefits, for example holy basil is used in India in worshipping God and called as Tulsi. You can grow the basil in small containers and indoor areas. prepare the basil spray 5 ounce of basil leafs and stem with mixture of 4 ounce of hot water with closed the aroma do not allow to escape. Left it for cool and use as spray in your home and outdoor which repels house flies and mosquitoes. Basil leafs are little bit spice keep away of your eyes because if happen it will irritates so carefully use the spray. Citronella oil which is extract from the lemon grass and it grow as ornamental plants. It also used in the dishes and for soups also for other recipes. Citronella candles are available it is a proof that repel mosquitoes. It is culinary herbal plant which repel fleas, mosquitoes and other insects. Prepare rosemary insect repellent by boil a bunch of rosemary leaves along with stems in 1 litre water for half an hour. Let the water will cool and filter by strain in to the spray can if you can use immediately for later use store in refrigerator. The neem is a tree which has more traditional use in India. Neem twigs are still used as natural use and throw toothbrush in India. It has high medicinal values it prevents and cure various skin diseases. Neem performs vital role in pest control, the neem seeds used for pest control in crops, such as neem cakes neem used as natural fertilizers. It does not kill insects but it work as antifeedant and repellent for insects. Burning dried leaves of neem which will repel the mosquitoes and other annoying bugs in garden and outdoor. Neem leaf bath will help to repel adult fleas, eggs, larvae it works both humans and pet animals. Neem leaf bath which will prevent any skin infections and helps to cure. Marigold are companion planting which is grows between vegetable crops. Marigold kill bad nematodes in soil that destroy vegetable crops. Marigold essential oil is used for purpose of antifungal and to treat fungal infections. Marigold flowers are in both red and yellow colour. The smell of marigold which acts as insect repellent it repels mosquitoes and aphids. Chamomile is the plant know for herbal tea which is used to treat the common cold. Gardener plant the Chamomile because not only for its medicinal value, it will repel fleas. Another main thing is Chamomile plant keep helping to grow another plant healthy way. Peppermint loves to grow in moist soil and shaded locations. You can grow peppermint in pots for both indoor and outdoor. Peppermint oil is used for natural pesticides, biting insects such as mosquitoes and fleas does not like scent of peppermint. Venus flytrap is a carnivorous plant instead of repelling insects it eats them. It grown in both indoor and outdoor with moist soil. Venus fly trap catches the flies and biting insects due to the lack of nitrogen in the soil. Venus fly traps mostly used to kill and prevent flies and biting gnats in home. Pennyroyal is a perennial herb it is used for various purposes such as herbal, culinary and even in decoration. Pennyroyal is used as pest repellent and it protects fleas, gnats and mosquitos. Even in some flea collar the pennyroyal herb can be used for lining. While using pennyroyal plant it act as pest repellent, concentrated pennyroyal oil is toxic for both humans and animals. Clove are the plants which has aromatic flower buds. Apart from all herb plant clove is cultivated for commercial purpose and it as medicinal values too. Clove oil used in toothpaste and also works as mosquito repellent.